Reviewing a collected trade paperback can sometimes be tough. When a book is great, it’s a cynch, when it’s bad, it’s a chore. Thankfully, Cosmic Avengers gets everything right, but something still niggled at me. It’s too damn short. Brian Bendis’s first arc of the Marvel NOW! relaunch of Guardians of the Galaxy is everything fans wanted. It’s exactly the right balance of drama, action, comedy, and great characterisation we’ve come to expect from Bendis, and aside from throwing Iron Man into the mix somewhat unnecessarily, the book is also a change from the Marvel norm in that it is refreshingly free of New York City, with the team even taking to the skies above London for a battle with the Badoon when the team do eventually visit Earth. 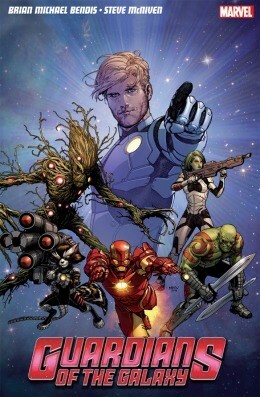 If you’re unfamiliar with the Guardians pre-Marvel NOW!, it’s really not a problem here. Bendis manages to skip the boring team-assembly tropes we’re used to, whilst still managing to keep readers from feeling alienated or left out of the loop. As you might expect, Star-Lord is front and centre of the story here, but Rocket Raccoon is the star, with his “BLAM! Murdered you!” attitude and endearing relationship with his ol’ buddy Groot. Steve McNiven and the fantastic Sara Pichelli handle art duties in these opening issues, and the results are sharp, vibrant, and quintessentially Marvel. On a personal note, I don’t love either of Star-Lords recent outfit re-designs, but I certainly don’t hate them, and Gamora’s new body armour depicted in these pages should have made it into the movie. Fact. Everyone else gets their share of face-time in the four short issues compiled here, and the collection is padded out with Tomorrow’s Avengers – four short digital-first stories that each spotlight a member of the team. These aren’t really essential character reading, and the only reason this book won’t score 5/5 in this review is that they are clearly only included here to up the page count. They do all have their own tone and art styles that make them worth a look, though, and the Rocket Raccoon tale printed here is now playing out in his own ongoing monthly title, which may draw some readers in. Along with the current Fantastic 4 title, this has been one of my favourite relaunches of any book in recent years, and this collection is a great place to start if you’re a new reader looking to jump on. As I mentioned earlier, I felt this arc was over too quick, and at 5 issues, it may feel like you’re not getting much bang for your buck, but at a really reasonable £13 retail price, I just can’t see why you wouldn’t want this on your shelf. You can purchase Guardians of The Galaxy Volume 1: Cosmic Avengers TP from Turnaround Publishing (who generously provided the review copy for this title) via their official website.